Plant derived pharmacologically active compounds have gained importance in food and pharmaceutical industries. The aim of the present study is to identify and study the antioxidant, antimicrobial properties of the phytochemicals present in the crude extract of Eugenia caryophyllus flower buds. The antioxidant activity of the methanol, acetone and chloroform extract was evaluated by 1,1-diphenyl-2-picrylhydrazyl (DPPH) assay. The methanol extract showed better radical scavenging activity than other selected solvents. Preliminary screening of phytochemicals was carried out in methanol extract and total phenol content was found high. Antibacterial activity was determined by well diffusion assay and methanol extract was found effective against Klebsiella pneumonia. FTIR and GC-MS results indicate the presence of aromatic compounds and major constituents were found to be eugenol and eugenyl acetate. 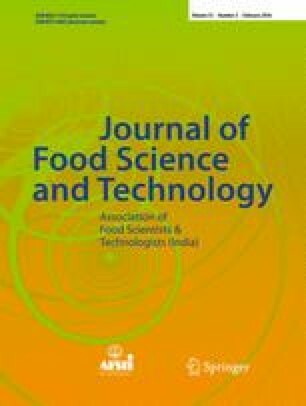 Results of this study implied that Eugenia caryophyllus flower bud extract could be considered as health nutriments in food and pharmaceutical industries. We would like to express my sincere gratitude to Director, Principal and staff of Department of Biotechnology, Karpaga Vinayaga College of Engineering and Technology for providing facilities to carry out this study. We also thank the Journal Editor and Reviewers for their valuable suggestions to improve our article and publication in JFST.